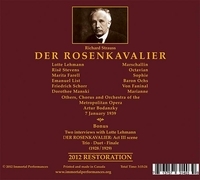 “For any number of reasons, this could not be anyone’s only recording of DER ROSENKAVALIER. On the other hand, if this opera is in any way important to you, this is also not a recording that you should be without. Richard Caniell’s restoration of this 1939 broadcast surpasses all previous issues in quality, even including the Met’s own lavishly produced (and lavishly priced) LP set. The sound is fuller, the voices truer and more natural, the sonic grit minimized to a degree I would not have thought possible. Caniell has an approach to restoration that has stirred up some controversy on occasion, and it might do so here. Bodansky made a number of maddening cuts in DER ROSENKAVALIER, and one of them was so frustrating to Caniell that he edited in a few minutes of music from a 1946 Met broadcast. He never hides this - he is explicit in his notes: ‘…there is at least one major cut I cannot abide. This is his removal of over two minutes of music in Act III, the big moment when Ochs is surrounded by the children calling ‘Papa’, amidst great confusion (while a major waltz theme is heard fortissimo), and everyone goes off, leaving the Marschallin, Octavian and Sophie alone. I have interpolated this important passage from a later Met 1946 broadcast (with List as Ochs). Now, I no longer experience the shock I felt when I repeatedly heard this recording in previous years’. He has done a masterful engineering job, so the sound from the 1946 broadcast matches. Surprisingly, the performance even maintains its momentum and shape, despite the fact that it is George Szell conducting the 1946 fragment (I do wish Caniell had identified him in his notes). I too find this particular cut on Bodansky’s part infuriating, and I don’t mind this approach at all - but if you’re a purist, consider yourself warned. Even with Caniell’s expert restoration, the sound of this broadcast is cramped and deficient in the full glory of Strauss’ orchestra. But it is now listenable to anyone with an ear attuned to ‘historic’ recordings, in a way that it never has been. Beyond the sound and Bodansky’s cuts, the other reason that this should not be anyone’s sole ROSENKAVALIER recording is the actual conducting of Bodansky. He does bring energy and incisiveness to a score that can seem to drag, and he is sensitive to his singers. But there are times when the music would benefit from a somewhat more expansive approach. I am partial to the Solti/Crespin recording on Decca, though of course the Karajan/Schwarzkopf has many committed fans too. So why can you not be without this? Primarily, but not solely, Lotte Lehmann in one of her greatest roles, caught in terrific voice and in a real performance. Her studio recording of most of the role for EMI in an abridged set (conducted decently enough by Robert Heger - reportedly EMI didn’t want to pay the fees asked by Strauss or Bruno Walter) is a classic, and has somewhat better sound. But here we have more of the role, and Lehmann motivated by the full theatrical experience of a stage performance. Her Marschallin is one of the truly great operatic characterizations, worthy of mention with Chaliapin’s Boris and Caruso’s Canio, and to have it in this form is to have a treasure. In addition we get the young Risë Stevens’ deftly characterized and beautifully sung Octavian, a relatively unknown Sophie in Marita Farell, but one who sings with the pure silver tone this music wants. Emanuel List was the Ochs of choice for many years, though I find that he slightly overdoes the boorish side of the character and his singing here is a bit rough. On the other hand, Friedrich Schorr as Faninal is luxurious casting in the extreme. Caniell adds a bonus to the third disc: the final scene, pasted together from two different recordings. Frieder Weissmann conducts the scene that includes the great trio, and Meta Seinemeyer is exquisite as the Marschallin. Her voice sounds better here than on any other transfer I have heard of her. Then the final Octavian-Sophie duet is beautifully sung by Elfriede Marherr (Octavian) and Adele Kern (Sophie) with Julius Prüwer conducting. The join doesn’t quite work as well - the different voices and conducting work against it, but it is still a pleasure to hear these classic records from the late 1920s reproduced so well. Two interviews with Lehmann are included (after each of the first two acts), and we get some (but not all) of Milton Cross’ announcements. "The most famous of pre-war Marshallins was unquestionably Lehmann, one of the great Elsas and Sieglindes of her day, who created the lyric soprano role of the Composer in the Vienna premiere of ARIADNE II and the dramatic soprano role of the Dyer's Wife in DIE FRAU OHNE SCHATTEN. Lehmann's voice must have developed gradually into the heavier parts, for she is the first of several celebrated ROSENKAVALIER 'hat-trick' holders: sopranos who have progressed from Sophie to Octavian to the Marshallin. Lehmann was clearly one of the sopranos who served as inspirational muse to Strauss: in addition to the Composer and Dyer's Wife, she was also entrusted with the creation of one of his most individual and beloved protagonists, Christine Storch in INTERMEZZO, a thinly disguised portrait of Strauss' wife Pauline. [One shouldn't forget that his Arabella was written with LL in mind]. Lehmann's dramatic conception of the [Marschallin] manages to convince despite her age: she is coquettish with both Octavian and Ochs, using a sly portamento ('Du, Schatz!') to convey her amusement at the Mariandel disguise, and she seems more tolerant than most of her successors of her 'aufgeblasene, schlechte Kerl' of a cousin. Indeed, from the histrionic point of view, Lehmann maintains the melancholic and frivolous sides of the Marschallin's personality in carefully balanced equilibrium: the dry eye much in evidence in her teasing of her lover and remonstrations with Ochs, the wet one in her nostalgic reminiscences of 'die kleine Resi' fresh from the convent in the Act 1 monologue and especially in the 'Heut oder morgen' section the the succeeding duet with Octavian. Long experience of the opera has evidently led to a deep understanding of the Marschallin's mercurial temperament: her tears are not self-pitying ones and they do not for long dull the twinkle in her eye." "What memories this historic broadcast recording brings back to me! It was my first ROSENKAVALIER on the air and my first and only broadcast with Lotte Lehmann, taking place only a few weeks after my Metropolitan Opera debut in MIGNON. My teacher, Anna Schoen-René, felt Octavian 'would be a good role for me. She took me to the Mozarteum in Salzburg to study with one of Europe's finest Octavians, the soprano Marie Gutheil-Schoder. It was this remarkable woman who gave me the physical security and ease to become credible in portraying a young boy. When I did my first Octavian in Prague, at the age of twenty-two, thanks to Mme. Gutheil-Schoder, I was prepared." "Risë Stevens is a fiery and juvenile Octavian in a live performance conducted by Bodanzky opposite Lotte Lehmann, Marita Farell and Emanuel List, and in a performance under Fritz Reiner opposite Eleanor Steber, Erna Berger and Emanuel List (all at their best) [OP2054]. Both recordings are a 'must'."